I’m not a cosplayer, although I envy everyone who puts so much effort into their costumes and even makes them by their selves…but I do love Halloween! It is a bit early to think about Halloween, but I’m already planning my costume in my head. So I was really happy when the company Zugeschnürt asked me, whether I wanted to try and review any items from their shops. The corsages they offer were so pretty, I kept thinking about Halloween and my costume…Finally, I decided to try this Corsage by Chilirose. 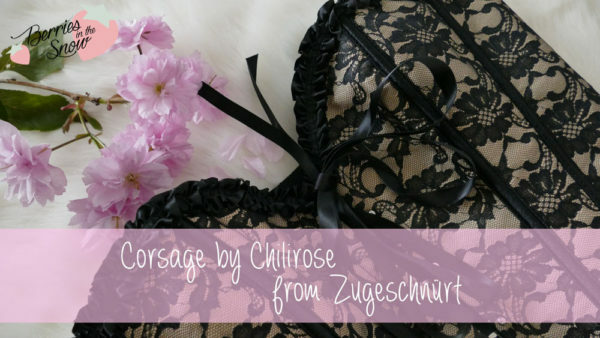 Zugeschnürt means “corded up” in German and since this refers to the mechanism of corsets and corsages it is clear what the company retails: it is all about corsets, corsages and lingerie. The difference between corsages and other lingerie lies in the point that a corsage can be worn as clothing item. It can be combined with pants or skirts and creates a very feminine and elegant look on top. You can already see from the packaging of the product, which came in a box with wrapping paper that the corsage has a higher quality. I bought Halloween costumes in the past which used like cheap-quality corsages or something similar looking, but this is totally different. It has integrated harder parts which give you a nice posture and add to give a slimmer waist. The corsage really feels like something proper to wear. It can be adjusted on the back by straps (be sure to loosen them before you wear the corsage) and has sturdy fastenings at the front to close the corsage up. There is a ribbon in the front as well… The pretty pattern shows black flower embroideries on a beige fabric. The pattern combined with the ruffling on the top and bottom rounds up the image nicely. It looks really high quality and elegant. The ribbons add even more to the beauty of this piece of clothing! I can imagine that this will look wonderful with a tufted skirt/knee-long ballerina skirt…or with an A-Line cocktail skirt. All in all I’m in love with my choice and I’m already looking for a skirt that fits to it, to make it a complete outfit. 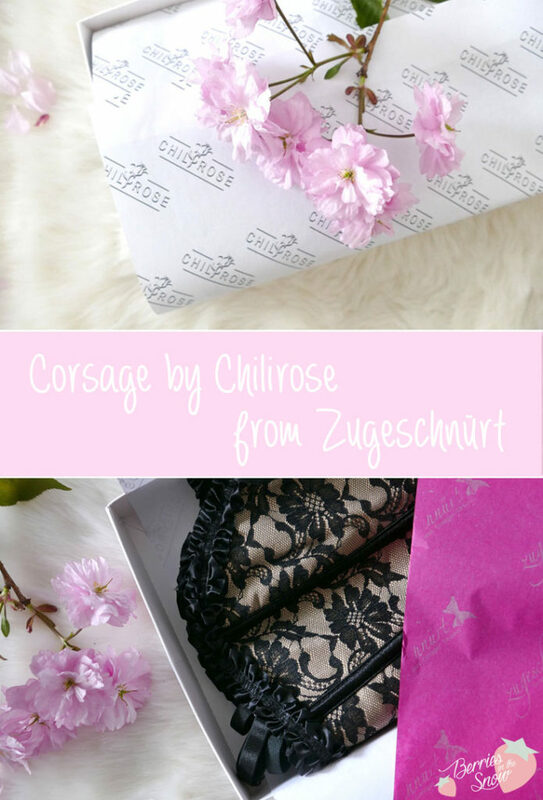 The Corsage by Chilirose retails for 39.90 € from Zugeschnürt and they also deliver to other countries than Germany. If you like corsages and corsets you might want to take a look at their other products, too! What is your opinion to this corsage? How would you combine it best? Just as a short reminder: All products mentioned and reviewed on this blog are of my personal opinions. This product here was sent to me for reviewing purpose by https://www.zugeschnuert-shop.de/ which doesn’t influence me in providing my honest opinion on the products. Sie ist echt sehr schön und hat eine tolle Qualität. Bin echt begeistert.